The medical director of the bustling Maternity Centre in downtown Hamilton, Dr. Tejal Patel, scours a packed waiting room for her 11 o’clock appointment. She has one nurse on hold, another conferring about a palliative patient from her family practice, is checking messages and is on 24-hour call with two patients due, but she drops into a chair with a grin. “Actually, today is a manageable day,” says Tejal, who is 39. She wanted to be a family doctor from the age of nine. “My dad got sick and he was in hospital for a year. We were there an awful lot, and ICU is a scary place for a kid,” she says. “The one constant was our family doctor. He knew our struggles as a family and he visited a lot. He knew everyone in there. When he came around, we all relaxed,” she says. Growing up in Toronto’s west end, she completed a biochemistry degree and Master of Genetic Engineering at McMaster University before medical school at Queens University. As a resident in family medicine, she was matched with McMaster University. 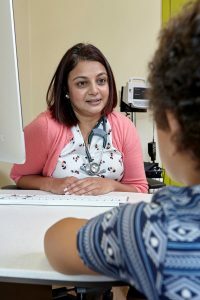 Since 2015, Tejal – in partnership with co-director and nurse practitioner Claudia Steffler – has been running the same centre, which opened in 2001 and provides prenatal, newborn and postpartum care to hundreds of area women every year, whether or not they have a family doctor. The day she took the helm, colleagues gave her a child’s wand and tiara to help her “magically solve” centre challenges, such as sustaining a strong group of family physicians who deliver babies for patients of the Maternity Centre, and ensuring potential patients are aware of the great choice for comprehensive maternity care available through the Centre, located at 100 Main Street West. In her role as Maternal Child Rotation Coordinator, Tejal and her colleagues have revamped McMaster’s Family Medicine residency program to boost family medicine obstetrical experience and build the self-confidence of family doctors entering practice, with the objective of increasing the proportion of family medicine graduates who deliver babies. Fulfilling work and very much the stuff of her childhood dreams, she says, although she keeps the magic wand on hand, just in case.